Tucked away in the remoteness of the Telugu-hinterland, lies a sight that has the potential to humble man before the glory and raw power of the natural order. The river Pennar (also Penna, Penneru), originating near the Nandi Hills in Karnataka, winds its way first north and then east towards the Bay of Bengal and carves out a gorge as it passes the Erramala hills of central Andhra Pradesh. 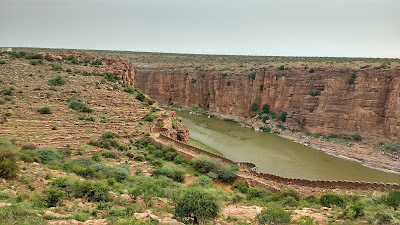 The southern wall of the gorge was the site of the medieval fortress of Gandikota - literally a fort (kote) on a gorge (gandi). 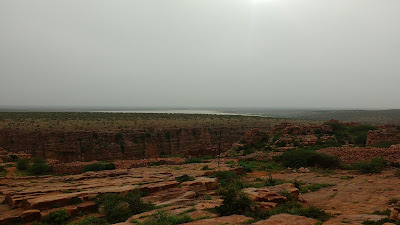 Gandikota, today, is a remote place with spartan infrastructure and spotty connectivity. Nevertheless, this is a place which has to be visited, if not for the history, then only to be humbled by the power of nature to shape our lives. 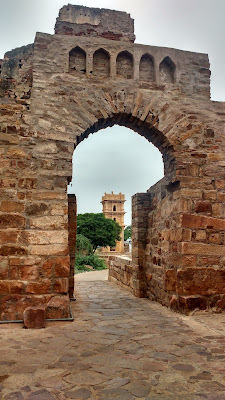 The Gandkota fort originated as a simple fortification on the southern side of the gorge in the eleventh century, at a site identified for having excellent natural defences. 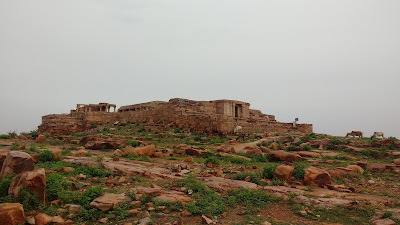 The fort in its present state was upgraded by the Pemmasani Naidu feudatories of the Vijayanagara Empire (Hampi) during the fourteenth century. 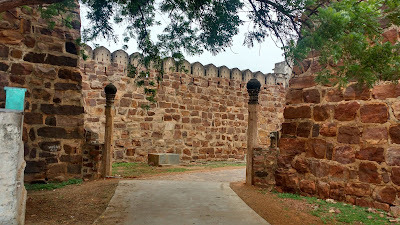 The fort passed through several dynasties and empires like the Golconda Sultans, Marathas, Tipu Sultan and eventually ending with the British who dismantled the armaments. The fort is almost squarish in structure with 101 bastions. 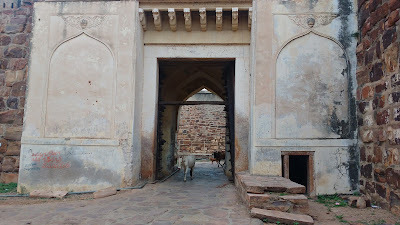 The main entrance is on the eastern side. the eastern, western and southern walls are at a level for most of the part. The northern wall follows the topography of the southern wall of the gorge - from a high of almost 400 feet above the river to a low of about a 100 odd feet. This northern wall is a perfect place to see the gorge and the river. The Pennar here has water almost through the year owing to two dams - one upstream and one downstream from the gorge. The fort has several structures of note which are covered separately. It is said in Hyderabad that all roads lead to the Charminar. 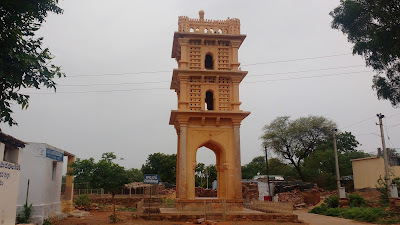 The same is technically correct for the Gandikota Charminar as well, since the only road from the fort gate passes next to the Charminar before branching off to toher sites. Also, let the name not fool you here - this Charminar is merely a single square structure, rather than one with four towers. 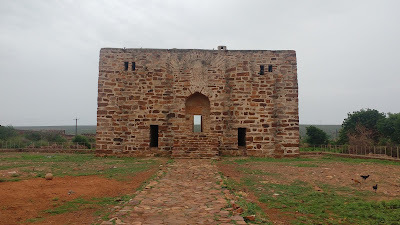 The monument is also the site of the small settlement which has been inside Gandikota for generations now. The majestic gopuram (entrance tower) of the Madhavraya Swami Temple is visible far before one arrives at the actual fort walls. The temple is approached from a path south of the Charminar, that passes adjacent to a dilapidated tank. 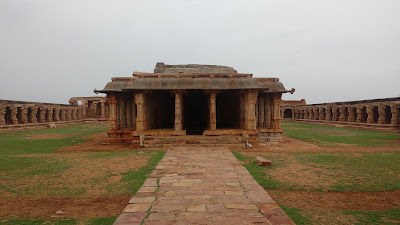 The temple has a rectangular plan that begins at the outer wall which has the aforementioned tower on the eastern side. 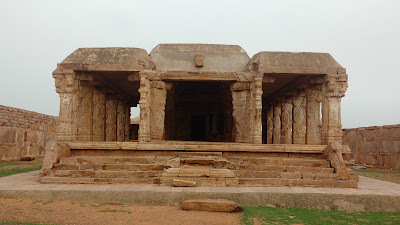 The main temple also faces east. 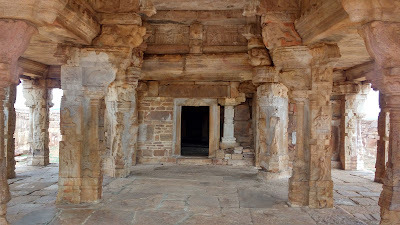 The temple plan comprises of an outer hall followed by an inner hall and then the sanctum. The temple has a flat roof without a distinctive spire. 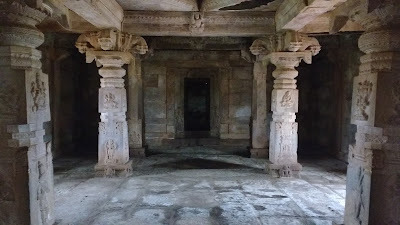 The outer hall has the traditional Vijayanagar-style cavalry motif on the pillars. 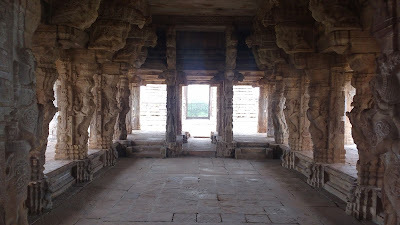 The inner hall has less ornate pillars, chiefly depicting various Gods and Goddesses. The sanctum is empty, except for bats. The site is a haven for the local langurs. 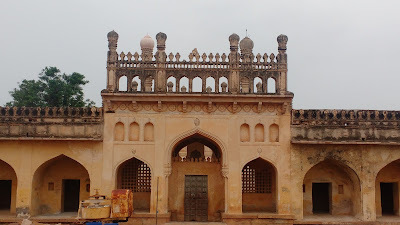 The Jumma Masjid and the Granary are located in a single complex west of the Charminar, next to a stepped tank labelled simply as the 'Big Tank'. 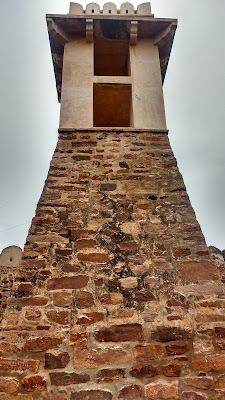 The granary is supposed to have a vaulted roof, while the mosque is known for its intricacy. This complex was locked at the time of my visit, so I could not see how it actually looks form the inside. 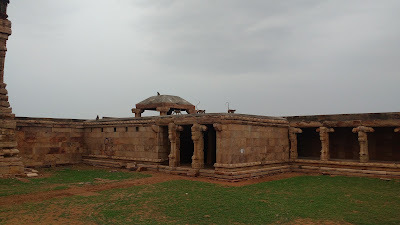 This temple is located to the north of the mosque and granary complex on an elevated hillock of sorts. 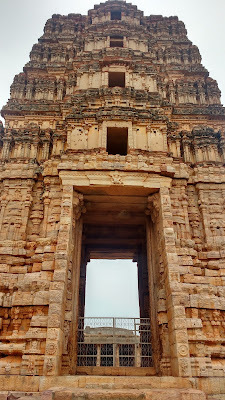 The inner structure has similar motifs to the Madhavaraya Swami Temple, but comparatively less ornate. 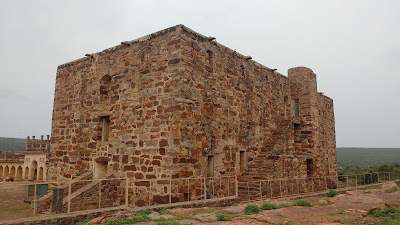 The outer walls give a panoramic view of the entire fort. 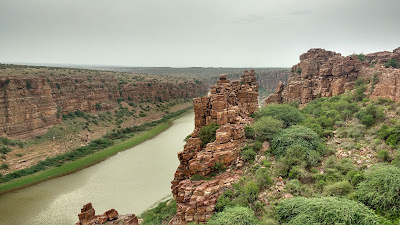 This is the calling card for Gandikota - the Pennar Gorge. The path from Ranganatha Alayam continues northward to the gorge. The last part of the trail to the gorge involves hopping on the boulders that comprise the landscape. 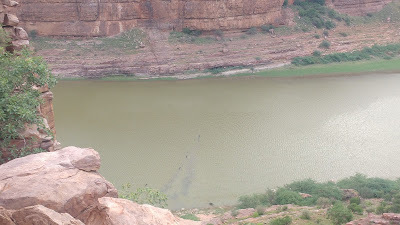 This is the highest point of the gorge - the greenish river flows silently below. Westward from this point, the wall slopes down to almost meet the river. There are bastions there and it is possible to descend all the way down. 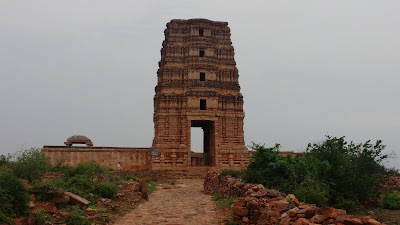 The nearest town to Gandikota is Jammalmadugu, about 10kms away. The town has limited tourist infrastructure with a couple of lodges. APSRTC connects Jammalmadugu to Bengaluru and Hyderabad. 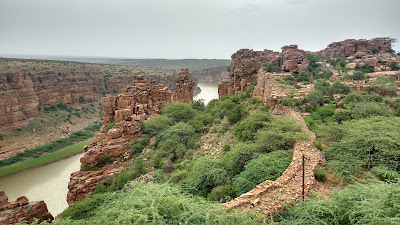 There are three buses through the day that go to Gandikota, with the first bus leaving at 5:30am. Rickshaws are available as an alternative. 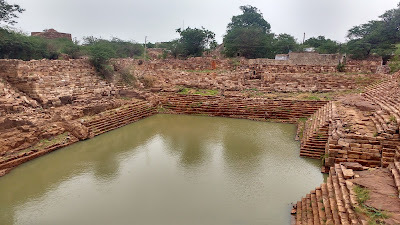 APTDC has a resort of sorts next to the Gandikota fort. The resort itself is fashioned to look like a fort. Reservations are strictly online, with spot bookings not being entertained. They serve breakfast after 7am. 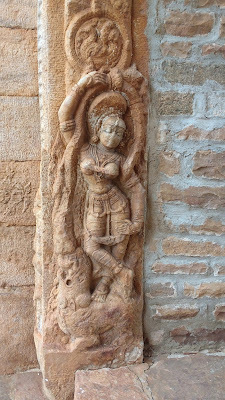 Gandkota is a rewarding place. The endless vista of the Erramala, punctuated by the green river below, with occasional cattle crossings paint a beautiful canvas - a canvas in which one may feel inconsequential at best, or even timid to realize what minuscule power one holds over the might of nature. It's a little off track, but surely worth a visit. Also, one may head to Belum caves and/or Tadipatri for some more beautiful but offbeat places.